Joel McKeon didn't get much of a chance to show what he could do in spring training 1986, The Chicago Tribune wrote. That's because he hurt his wrist. At AAA Buffalo in April, though, McKeon showed exactly what he could do. He also earned his first call up to the majors. "I had my forkball working," the new White Sox pitcher McKeon told The Tribune of his time at Buffalo. "Hopefully, it will stay." For McKeon, his forkball and other pitchers ended up working well enough to keep him up in Chicago into July, until illness cut his season short. His pitches also worked well enough to get him back to Chicago the next year. In a pro career that continued another four seasons, though, he wouldn't return. McKeon's career began in 1982, taken by the White Sox in the first round of the June secondary draft, out of Miami-Dade College in Florida. With the White Sox, McKeon got 11 starts his first season, four in the rookie Gulf Coast League and seven after making the jump to AA Glens Falls. At Glens Falls, he went 5-2, with a 3.00 ERA. After playing at single-A Appleton in 1983, McKeon returned to Glens Falls for 1984 as as reliever. McKeon got into 45 games that year for Glens Falls, five starts, posting an ERA of 3.64. 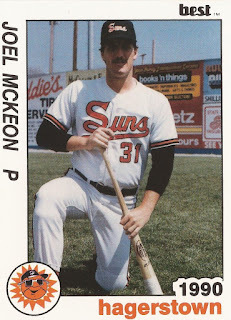 McKeon moved to AAA Buffalo in 1985, returning there to start 1986. It was that May 3 that McKeon made his debut with Chicago. McKeon ultimately got into 30 games in relief for the White Sox in 1987, posting a 2.45 ERA. He also picked up three wins and a save. McKeon picked up his second relief win by mid-May, the second coming on two innings of work, The Tribune wrote. "I told him that we'd use him," White Sox manager Tony LaRussa told The Tribune after that second McKeon win. "Spots on the major-league roster are precious. If you have a guy for a certain role, you use him." By July, McKeon was pitching well. Then he came down with hepatitis, having to be hospitalized, The Tribune wrote. His teammates also had to get preventative shots. He was out for the year. He came back for 1987, but his numbers suffered. After 11 outings, his ERA hit 8.00 and he got sent back down. But he pitched well enough there to get another chance in July. "I'm starting to get the forkball over," McKeon told The Tribune. "Ive quit trying to throw the ball past hitters when you don't throw that hard. I've got my timing together. Hopefully, it will show." McKeon, though, lasted just two more outings, his last giving up four earned runs in 2.2 innings of work. McKeon continued playing through 1991, moving through the Padres, Braves and Expos systems, before landing with the Orioles for his final two seasons, ending his career without returning to the majors.